There are a few rural areas within Transport for London's sphere of responsibility, and one of them lies between Biggin Hill and Orpington, with Downe village in the middle. Downe had the 146 to Bromley, but otherwise this area was completely devoid of public transport. 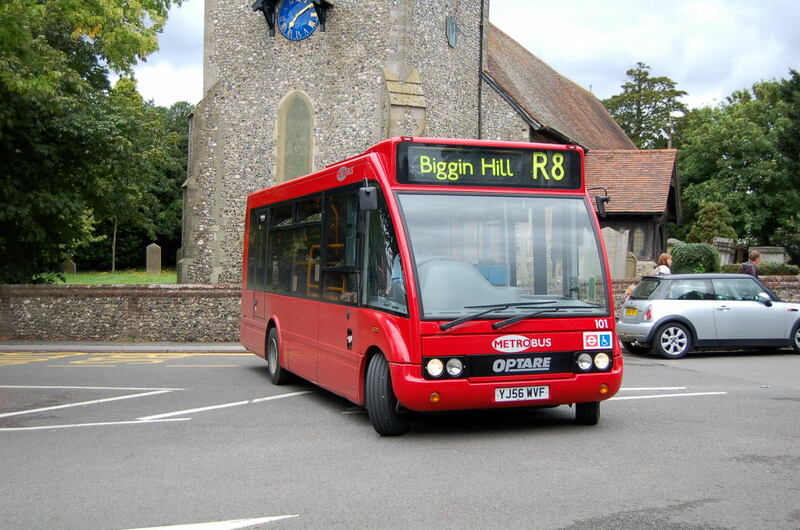 Concern as to the lack of a direct bus link between Biggin Hill and Orpington, with resultant journey times of well over an hour, coupled with the significant number of homes along the lanes in between which had no bus service, led to the formation of the Orpington Rural Transport Association in 1962. Due to the narrowness of the country roads the route was proposed to use, minibuses would be required; it should be borne in mind that a "minibus" in those days was quite literally a converted van, effectively the equivalent of a modern day MPV people carrier in size. As this was not something London Transport was likely to contemplate, ORTA proceded on the basis of running the service itself. The first step was to obtain a licence from LT, which, predictably, was not sympathetic, and insisted on providing the service itself – or rather, the closest thing it could provide. Route 479 began on 16.2.63 providing four return journeys on Saturdays, operating via Main Road and Shire Lane, which were suitable for operation with vehicles in LT's fleet. Thus the objective of linking Biggin Hill with Orpington was fulfilled, but not that of serving Berry's Green and Luxted. As expected, the route was not a tremendous success in this form, and was duly withdrawn, an "unforeseen" Road Service Licence being granted to ORTA to continue operating the service from 22.6.63 using a hired minibus. The intended routeing via Downe was achieved from 27.7.63 – no route number was used. The routeing was via Jail Lane, Single Street and Luxted Road to Downe, and then via North End Lane and Shire Lane to Green Street Green and Orpington. At Orpington, the service terminated at the War Memorial roundabout, in Sevenoaks Road, rather than continuing to the station as the 479 had done. The association obtained its own vehicles, and services were generally crewed by volunteers. The number of journeys was increased, and calls grew for a weekday service, which arrived first on Tuesdays. From 1.9.64, other days were added, and a driver was employed for the weekday services. The service was increased to hourly on Tuesdays to Saturdays from 1.9.65 (the Monday service was peak hours only, as this was still considered "washing day"), the running time being 26 minutes each way. Development of Biggin Hill Valley in 1966-67 led to proposals to extend the route to this area. In the end the solution adopted was a half hourly service from Orpington to the valley via Stock Hill, with alternate buses running to New Addington via Oaklands Lane and to Tatsfield via Sunningvale Avenue. Services commenced on 28.3.67; however, delays in completing the development and opening the roads led to financial difficulties, and the Tatsfield service was withdrawn from 1.1.68. The New Addington service was later curtailed to Biggin Hill Valley also, and larger Ford Transit vehicles were introduced. When the Roundabout network was created in 1987, Crystals surrendered the 858, which was incorporated into the network as route R2. November 1992 saw the route extended to Petts Wood Station (east side) via Amherst Drive. Upon re-tendering in 1995, Selkent lost the entire Roundabout network, mostly to Centrewest, a newcomer to the area. However, Crystals successfully tendered for the R2, and operations commenced on 2.12.95 using Mercedes 811D minibuses. From 1.12.01, on commencement of a new operating contract, the frequency was increased to half-hourly, at the expense of route R3, which was reduced from 3 to 2 buses per hour. This arrangement provided, in theory, a more even service between Orpington and Petts Wood, although in a brilliant fit of timetable design, both half hourly services were timed to run at roughly the same times in both directions. On 16.8.03, Crystals was purchased by Tellings-Golden Miller, who drafted in their own Mercedes minibuses for most of the routes. The above described structure remained in place until the desire for low floor operation prompted a review. The roads between Biggin Hill and Green Street Green have not got any wider, and are simply too narrow for modern full width buses to pass other traffic easily, let alone another bus! The old minibuses fitted OK, but low floor versions would not have enough seats to meet loadings. Therefore the scheme adopted was to divert the R2 via Keston Mark, with larger buses and an increased frequency, and introduce new route R8 to cover the rural section – thus reverting to pretty much its 858 form, which the R8 number coincidentally recalls. At Biggin Hill, instead of running to the valley (left to the R2) buses turned via Aperfield Road, new bus territory. New Mercedes Sprinters were ordered, and the route commenced operation on 21.2.04, initially running under the R2 contract. Just two weeks later, 6.3.04, there were some detail changes to the routeing in Orpington. On 5.3.05 the Orpington operation of T-GM was sold to Metrobus – and thus that company got to operate the one route it did not acquire from O&D in the first place! The hourly headway timetable proved unworkable (even though it had worked fine in ORTA days), and from 22.10.05 buses were revised to run basically every 65 minutes, not an ideal state of affairs. The R8 was put onto its own contract from 2.12.06, and the Sprinters were (a little belatedly) replaced by the new narrow and extra short (7.1m) version of the Optare Solo. Two vehicles are in the fleet, when only one is used in service at a time! 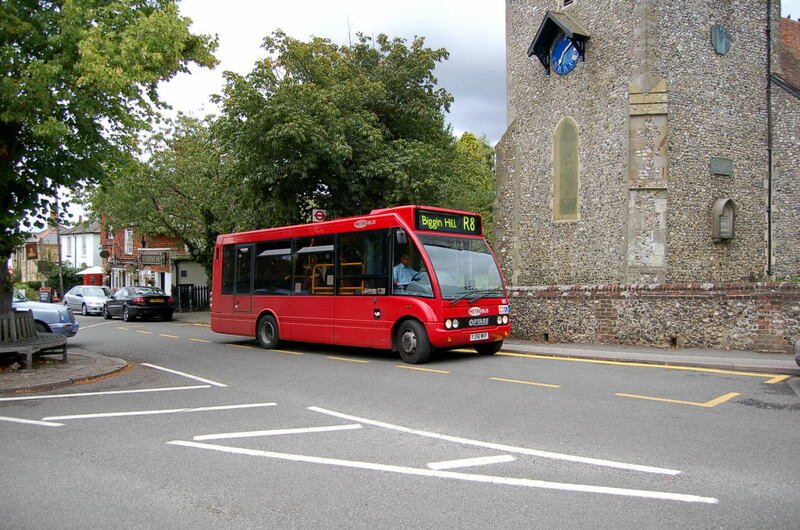 Two photographs are here provided of 101 (YJ56 WVF) calling it at St. Mary's Church in Downe on 18 August 2007, with Downe High Street in the first view. This is also the terminus of route 146, and route R8 deviates off Luxted Road to call at the stop here, on the corner with Cudham Road.